I received a great question in the email about change of rein, so I decided to make a post about it. When I first saw the term in the PATH Intl Certification Riding Test, I was confused. I had never heard of it before. And unless you ride horses classically, it’s not intuitive to figure out what it means. So here’s some help for you all. Enjoy! What is change of rein? Basically, when you change directions of travel in the arena. More detailed, it’s changing directions AND changing the bend of the horse. 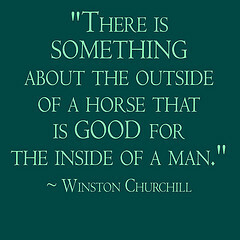 In order to evenly exercise both sides of both horse and rider. Switching the bend helps supple the horse. Prepares the horse for the next exercise. 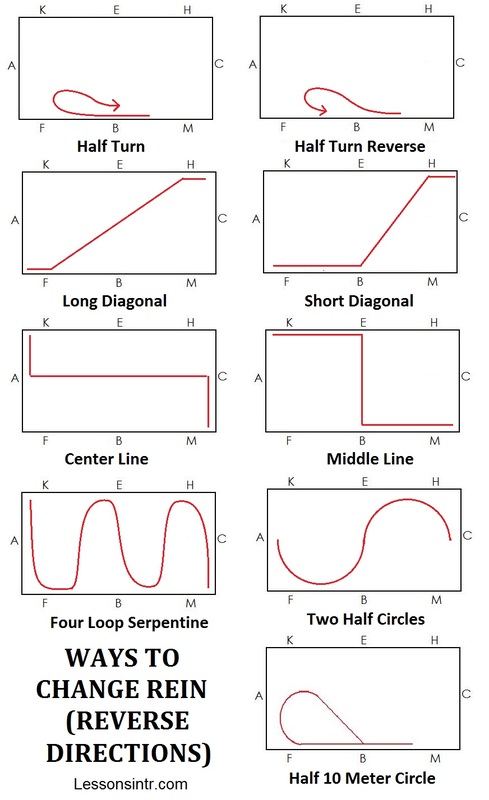 We will focus on the long diagonal, which is the easiest. Why? Prepare the turn – a few lengths before each turn, half halt your horse to let him know something’s coming up. Look ahead and plan your turn. Bend – bend the horse in the direction of travel, balancing him between the inside leg and outside rein, outside leg just behind the girth to keep his haunches straight. Turn – bend the horse smoothly through the turn, the curve of his body should match the line he follows without resistance, ridden as deeply into the turn as is appropriate. Straighten – come to feel both reins evenly and sit evenly on both seat bones. Some figures have a long straight stretch, others very short or not at all. Half halt to tell him something’s coming up. 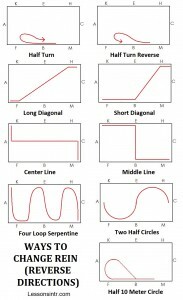 Change diagonals – if you are posting the trot. New Bend – transfer the horse smoothly to the new outside rein and inside leg, shift weight to the new inside seat bone, and establish the new direction of travel. Look ahead and plan your turn. Turn – half halt to let the horse know something’s coming up, then bend the horse through the turn in the new direction. Finish the turn – straighten him out, keeping a slight bend in the new direction. Same as above, but work on maintaining the same rhythm and frame of the horse throughout the entire exercise, making everything smooth. Turn the horse when his shoulder reaches the letter, 1-2 strides after the corner, to avoid making sharp turns. The horse’s shoulder should reach the letter when he reaches the other side of the track, a few stride before the corner, to avoid making a sharp turn. The horse tries to cut corner. The rider should use the inside aids more strongly, instead of pulling the horse back to the rail (in which case he puts his head toward the rail and falls on the inside shoulder). The rider over turns their horse. Work on finishing the turn earlier. The rider doesn’t turn their horse enough. Work on planning ahead and stronger aids. The rider turns too soon, creating a sharp turn, which is hard for their horse to balance through. Work on planning ahead. The rider carries both hands to the outside, causing horse to fall to outside shoulder. The horse throws his head, rushes, shortens stride, or bobs his head. 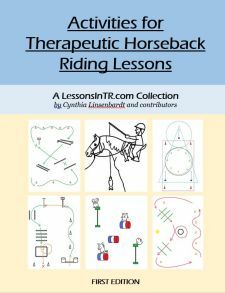 Work on the coordination of the aids so the rider is not interfering with the horse’s balance, and any of the above problems that might be included. Use cone markers to tell riders where to start turning and where the middle of the arena is. Use colored wrist bands to help riders with their rights and lefts. Use a whiteboard or pictures to show the rider what the figure looks like. Use a guide the first time, someone the rider can follow through the figure. “Change rein across the diagonal” is part of PATH Intl’s Registered Instructor Riding Test at the Certification. They want to see good control of the horse, bending in the corners, not cutting corners, and changing the bend of your horse. The change rein at the posting trot requires changing posting diagonals correctly. If you get it wrong, fix it! They want to see if you notice your mistakes. For the change rein at the sitting trot, you may want to slow your horse a little in order to sit the trot.